Perfectly positioned on a prominent tree-lined street in Pacific Heights, 2740 Pierce St is the quintessential San Francisco residence. Occupying the top two levels of a boutique two-unit building, the home is appointed with three bedrooms, two bathrooms, two exclusive outdoor decks, and two-car parking. Upon entering the home, you are greeted by expansive oak hardwood floors, a formal foyer, and tasteful original details. The stately living room is flanked by a wood-burning fireplace and built-in cabinetry, which benefits from a wall of picture windows overlooking the mature trees below. The adjacent dining room is accessed through an oversized doorway, creating incredible flow between the public rooms. Beyond the dining room is the spacious kitchen, featuring a breakfast nook, built-in banquet, and a series of windows that suffused the room with natural light throughout the day. Features include a gas range, double ovens, quartz countertops, great storage, and a pantry. Down the hallway, rests two spacious bedrooms, both with walk-in closets and beautiful eastern outlooks to St. Vincent de Paul and the surrounding neighborhood. Just outside of the bedrooms is the laundry closet with a side-by-side washer/dryer and additional storage. Completing this level is a full bath and linen closet. The master suite, situated on the top floor of the home, is flooded with natural light and enjoys a large walk-in closet. 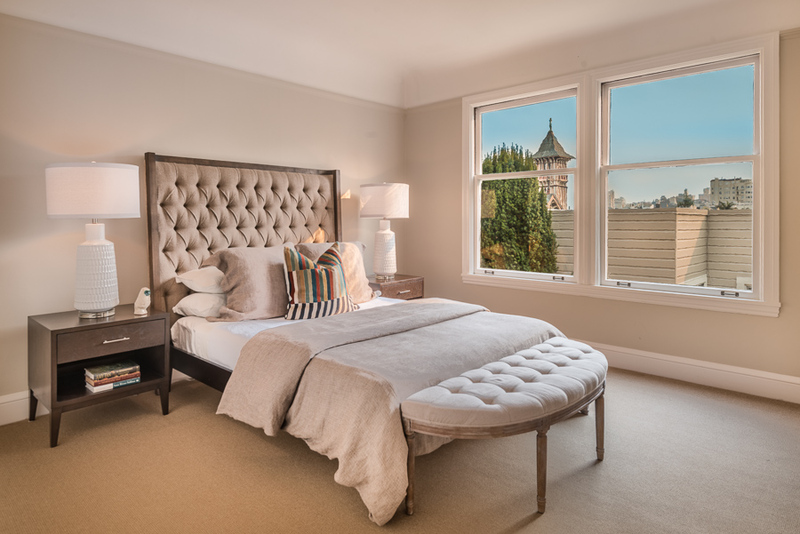 The room has incredible outlooks through a wall of eastern windows to Russian Hill, St. Vincent de Paul, and the surrounding neighborhood. A series of French doors leads from the master bedroom onto one of the exclusive decks, creating a serene master retreat. Adjacent to the bedroom is the second full bath, complete with a soaking tub, walk-in shower with dual showerheads, and a clerestory window bathing the room in sunlight. Up a series of steps is the flexible office/family room space that conveniently outfitted with extensive built-in cabinetry and shelving. An expansive northern window frames the incredible views of the Bay, Angel Island, and Marin. Through the French doors is the second exclusive deck, which overlooks the many prominent homes on the block, including the Casebolt House, Historical Landmark #51. The residence was originally constructed in 1922 and includes two car parking and additional storage. 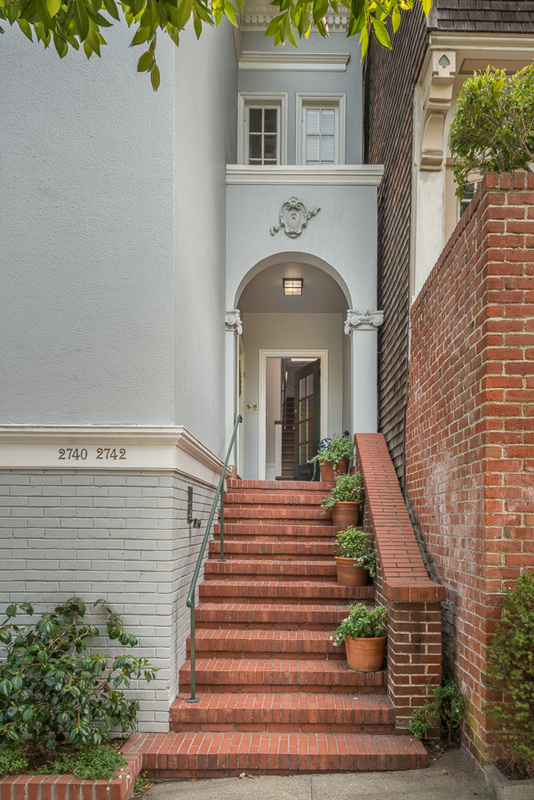 2740 Pierce St is located on a prestigious block in Pacific Heights surrounded by architecturally significant homes and within a short walk of the shops and restaurants along both Union St and Chestnut St.